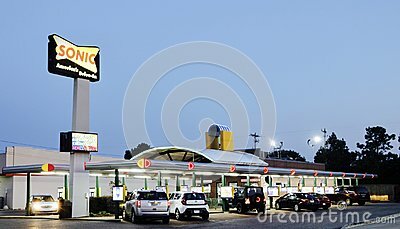 Sonic Drive-In, more commonly known as Sonic, is an American drive-in fast-food restaurant chain based in Oklahoma City, Oklahoma. As of August 31, 2016, 3,557 restaurants were in 45 U.S. states. In 2011, it was ranked 10th in QSR Magazine`s rankings of the top 50 quick-service and fast-casual restaurant brands in the nation moving the 13th for 2015 and 2016. Known for its use of carhops on roller skates, the company annually hosts a competition to determine the top skating carhop in its system.